Isao Takahata is not a name most Americans will recognize. Mention his name, and more often than not, you will be greeted with shrugs. But make no mistake: Takahata is a poet who has revolutionized animation as an art form. If you see his Grave of the Fireflies, you will be tempted to call it his masterpiece. I felt the same way myself, but I was wrong. Omohide Poro Poro is his masterpiece. I'll be even bolder and declare this to be the finest animated picture ever made; a grand achievement of animation as art form. It proves to be deeply moving, at many times overwhelming; yet is also close, small, intimate. This is one of the great movies of our lives. Takahata only made one fantasy adventure picture, his first, The Adventure of Hols, Prince of the Sun, in 1968 with Hayao Miyazaki. 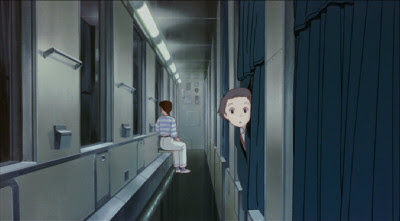 Miyazaki fell in love with adventure movies; Takahata moved in the opposite direction, towards realism. He strove to create animation influenced by neo-realism, a naturalism in the style of Jean Renoir and Yasujiro Ozu. Omohide Poro Poro best incorporates the traits and skills Takahata developed during the 1970's, when he revolutionized animation in Japan with World Masterpiece Theatre, presenting television renditions of Heidi and Anne of Green Gables, and then in 1982 with his great Goshu the Cellist. His style is reflective and deeply personal, very much like Ozu, but Takahata's greatest gift, for me at least, is his ability to take us inside the heads of his characters as their imaginations take flight. That trait is what made his version of Anne so memorable; here, he takes one story and molds an entirely different story from within. Omohide Poro Poro is the story of a Tokyo office worker named Taeko. At age 27, she feels dissatisfied, unhappy with her life. She slowly begins to question some of her life decisions, her choice in careers. When we first see her, she has decided to spend a week with her sister's in-laws who live out in the country. Taeko puts on a happy face and gets along well with others, but we discover that much of this is a shell, a cover. Over the course of the movie, she wonders out loud if her whole life has been a front to pacify the outside world. Perhaps she is entering another moment of growth in her life, and she begins to reflect upon another similar time, her childhood and early adolescence. The movie dances about, from the present day (1982) to Taeko-chan's tenth year (1966), and back again. For almost anyone's first viewing, it's the flashbacks in Poro Poro that leap out in our minds. These scenes are drawn in a style I've never seen before in an animated film. The screen is drawn very sparsly, with colors and details fading away at the edges of the screen. The amount of visual detail is striking, almost like sketches from a beloved children's book, painted with spring-tone watercolors. The 1966 episodes capture that painterly sense of nostalgia better than just about any other movie I've seen. One obvious comparison I could make is Wild Strawberries; imagine Bergman's classic, drowned in Warhol pop, echoing song lyrics like Bob Dylan in his prime. It's a thing of beauty to watch the past and present intertwine, commenting on one another, dancing in grand celebration of the joys and sorrows of life. How can I describe this to someone in America who only knows animation in the language of Walt Disney and Chuck Jones? Our first time watching Grave of the Fireflies is a lot like being hit in the chest with a cinder block. It's impossible not to be deeply moved, and I've discovered that Takahata achieves that feat in all his work. Fireflies, of course, has its poetic tragedy; this film affects me far more with its beauty and grace. Looking at the life of this woman, we identify with her awkwordness and tragedies. Taeko-chan's life is a series of setbacks, losses great and small. Granted, she is on a path to her self-discovery, but it isn't until the very end that you realize the great unspoken conflict in the movie. Namely, how did this precocious, curious child become the polite woman in a stale desk job? Her story is much like the Japanese saying that the upright nail gets the hammer; it's Takahata's thinly-disguised stab at his country's conformist culture. There are so many brilliant moments in the 1966 scenes that describing them would mean reciting the entire plot. I love the episode involving Taeko's crush on another boy in school; a baseball game is skillfully played as duel, chase, and showdown that captures all the magic and fear of first loves. I love the sequence involving the girls' emerging puberty and emergence into womanhood; it's both endearingly funny and sobering from a boy's point-of-view. I'm endlessly enamored with Taeko's short stab at acting, which leads to interest by the local college theatre group; it's a masterpiece of editing and pop montage, it turns horribly tragic, all set against the backdrop of a popular children's show called Hyokkori Hyoutan Jima. The final moment is a redemptive triumph that beautifully sums up Taeko's whole life, and maybe Takahata's, too. It may be the best scene he's ever filmed. By contrast, Poro Poro's other half - the story set in the present - exchanges the faded pop nostalgia for luminous, bold colors, family drama, and an almost documentary realism. Taeko's arrival in the country brings her in the company of Toshio, a young man who walked away from the punishing city life for the simple life of a farmer. "Do you like this music?" he asks Taeko as he walks her to his car. "It's music for peasants. I like it because I'm a peasant, too." His cheery demenor and thoughtful disposition begin a series of conversations between the two, very often in that tiny car. Toshio's conversion to a more traditional rural life fits in with much of the nostalgia in Studio Ghibli's films; I strongly suspect this may also be a direct conversation with the audience. By 1991, Japan's bubble economy had burst, plunging the nation into a cycle of endless recession that only now is ending. Takahata (who doesn't quite share Hayao Miyazaki's legendary work ethic) has little respect for the unrelenting corporate culture. His world resides in the quieter, rural Japan of the past. This life is neither shown to be light or trivial; it is hard work at long hours and little pay. A brilliantly moving sequence goes into great detail showing the process of picking safflowers to make cosmetic dyes, and then brings us to the fields at dawn as Taeko and her relatives pick flowers. Now maybe I was mistaken before; maybe this is the greatest scene Takahata has ever filmed. This moment is so sparse, so perfectly zen, that we almost think we're watching nothing at all. But watch them pick flowers. Listen to that majestic Hungarian folk and choir music - such marvelous music! - and just wait, enjoy the moment. Gradually, slowly, almost in real-time, we see the sun peak behind the mountains, and it dawns on us: we're watching the sunrise. It's just about the most beautiful scene I've ever witnessed. When you look at Isao Takahata's greatest works, you find a crucial common denominator: Yoshifumi Kondo. Kondo served as the charcter designer and animation director on Anne of Green Gables, a role he reprised faithfully for years at Studio Ghibli. His drawing style is superb, absolutely perfect for a naturalist style. His sensibility is also close to Takahata's, who later remarked that both Grave of the Firefles and Poro Poro could never be made without him. I say Kondo was the best character artist in the business, and his death in 1998 remains a terrible loss. The official western title to this film is "Only Yesterday," although I confess I much prefer the original Japanese title, "Omohide Poro Poro" It can be (loosely) translated as "Memories of Falling Teardrops," which appeals to me because of its Yasujiro Ozu influence. It seems fitting to me that both Japanese filmmakers should be mentioned in the same breath. This film is a work of genius - Ozu painted with watercolors. The two things I appreciate most about both Miyazaki & Takahata are their (almost?) religiously inspired earth-centered themes and strong, sensitive portrayals of female characters. Since Takahata infuses the spiritual singing of Bulgarian women's dainas with Toshio's rural world and the scene you mention where the farmers pray at sunrise makes me think that Ghibli's "environmental" stance goes beyond the merely political. To them, it is a religious necessity & survival issue for humanity to "go back to the land." I am so glad i decided to do this Ghibli catch up this week. Just finished Only Yesterday and was blown away. I only wish that it was dubbed by Disney so that i could share it with my family (English is their second language and they struggle to keep up with subtitles). When i finished this wonderful film i was linked the trailer to Princess and the Frog, a film i was anticipated quite a bit. And while the animation looks fantastic, i just wish Disney could make a simple story like this, animation is a medium tat allows you to create such power from such simple stories. Hopefully Disney can get over their fear of menstration and give this movie a proper go on blu ray. @return: I'm glad you loved this movie. Since you've seen it, you can understand why Disney will never release it here in the US. It's not just the subject matter of girls having periods, or the older sister who's gay. It's the scene that depicts a naked child in a Japanese bathhouse. There isn't a studio executive anywhere in the world who would volunteer to put their head on the chopping block for this. And you've seen the mass hysteria whipped up the wingnut right in this country. That conservative base is one of Disney's key demographics. Ideally, we would live in a civilized country, and this would never be an issue. If Disney presented the Studio Ghibli films as a seperate brand, that might help a little, maybe, maybe not. Personally, I think the smartest move would be to hand Omohide Poro Poro (and I Can Hear the Sea) to Criterion Collection. Let them put it out on DVD and Blu-Ray, and quietly collect the royalty checks. I'm not sure where you got your translation from, but Omohide poroporo actually doesn't mean "Memories of Falling Teardrops". The word "Omohide" means memories, and the word "Poroporo" is how the Japanese write the sound of something, like teardrops or just anything, trickling down. The title is likening Taeko's memories to this kind of trickling. A very awkward translation could be something like "Memories trickling down". However, converting this to "Memories of Falling Teardrops" is incorrect and really just gives an entirely different meaning to the title than what Takahata intended. Daniel, do you mind if I link to your lovely review of this film? I've been watching and writing about a lot of animation and I am going to publish a post of links to 'animated' reviews at my small blog. I'm just trying to open my own eyes to what is an under-discussed part of Cinema. Thanks. This blog is a fantastic Ghibli treasure trove. @stephen: Go ahead, steal whatever you need. It's free for the taking. Thanks for the kind words. Is this essay really reaching its 5th birthday? Time flies. I apologize for asking such a banal question but would you happen to know what Toshio's car was? It looks like it was drawn from a model that existed and the first time that little car appears has probably worn thin on my copy because of the number of times I'd played it back. @otheryaddayadda: That's an excellent question. I don't know what model car Toshio drives in the movie. I have no doubt it's a real make and model from the early '80s. Takahata's realism demands such true-to-life details. Keener eyes would be able to discern the answer better than I can. I haven't yet seen this one, Daniel, but what did you think of it and Pom Poko's rather (uncharacteristically) curt dismissal by Michael Barrier? "If you saw the two animated features directed by Miyazaki's Studio Ghibli colleague Isao Takahata on Turner Classic Movies the other night, you may have come away, as I did, with fresh respect for Miyazaki's strengths as a filmmaker. The Takahata features, Only Yesterday and Pom Poko struck me as nothing more than moving manga, very long (around two hours in both cases) animated Japanese comic-book stories, a criticism I would never level at Miyazaki's films. Pom Poko was especially exasperating. Magical animals who can transform themselves into almost anything fight back against bullies that would despoil their woodland home; haven't we seen that story on the screen before? Yes, of course—Pom Poko is a two-hour Bugs Bunny cartoon, without the gags. Not for me, thanks." Michael Barrier's comments? Well, I mostly fear for his sanity. His eyesight. Or both. Have we even seen the same films? His patent dismissal of "comic-book" stories is another thing to be examined, once I'd get him on the sofa of my favourite shrink. I've probably read more good stories in "comic-strip" format (in Swedish, Danish, English, French, Italian, Dutch or Norwegian) than he has. And some of the very best stories were produced in Japan. Well, Takahata doesn't like to go the already trodden route. In "Chie" he made the "poor little girl" stand up for herself in a most magnificent way. In "Goshu" he talked about music composition as no-one has ever tried to. In "Grave" he didn't shy for the most difficult of story-telling, deliberately hurting the viewer (to make us feel the reality of war) in the process. In "Only" he juxtaposed two different storylines, mixing them in a unique way. In "Pompoko" he focused his story around a collective of characters, portraying them in no less than four (deformed, cartoony/normal, realistic and transformed) ways. In "Yamadas" he tried to make a pioneering big-budget digital movie out of a simple yet poignant and well-written daily gag-cartoon (with commercially disastrous results). what a beautiful review of one of my favorite animated film. I love your references to Ozu - I learned about him in my silent film class and absolutely love his unconventional filming style. Just curious, I was reading your reply to a comment and you mentioned that the older sister was gay ... I must've missed the subtleties but could you explain this a little more? Great article. I'm so glad I came across this piece, because I think this movie is my favorite animated movie of all time. However, as Shika mentioned graciously above, the title translation you gave in the article is inaccurate. Please edit it, or at least acknowledge her comment. Duly noted. I've made a slight edit, and added a paragraph explaining my views on the title. In this case, there is no such thing as a "direct" translation; the Japanese implies ideas that don't translate entirely to the West. @Per A J Johnson: Yes, the middle sister is gay. At least, that was my reading of the scene. Great insights on Takahata's films, too.